The EvoWoods represents a large milestone in the Wenger history. Please take the time to see the pages around here on Sakhome.com. All pages together are made to represent a complete information and show some of my impressions and research. 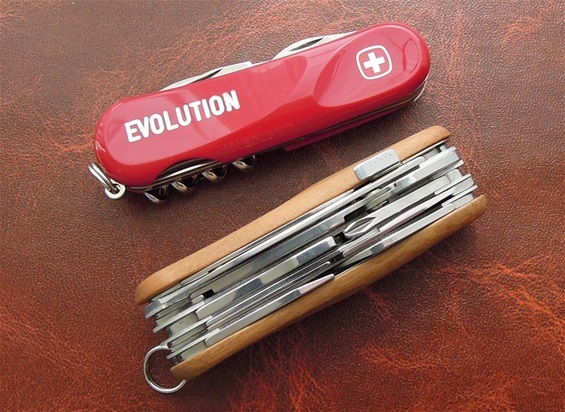 Wenger did incorporate the evolution on the wood handle knives and the use of a special attaching that is durable and strong. The EvoWoods and RangerWood knives are a big success and they quickly became famous around the world. They are very well liked by SAK enthusiast in the world. When Wenger first introduced the wood handle knives it was a surprise to many enthusiasts. So what is the quality on these handles and how well is the wood treated against moist and water? I have used this knife for EDC for well over one year and it’s been in my pocket together with keys and different everyday tools. I have had it as a backup running around the small islands out here and during fishing. This knife has been in saltwater surroundings and it`s been used for small wood work and maintenance. I am very happy with the durability of the wood and not any of the exposed wood areas got any cracks or breakage. They are attached in a very sturdy and strong method that is very well. I try to be careful with any tools but it is almost impossible sometimes to not loose balance and land on the side when out there on the islands. I have for sure landed on my side a few times and I am close to 100 kg. I have by accident dropped it on the ground a few times as well. Then some time ago by an unfortunate accident I had it in my pants and it went in the washing machine trapped in my pocket. It went through a full cycle at 40 degrees with washing liquids and softener. When I first realized it`s been in the wash was after a few hours. I found it very wet and I thought this wood must be damaged. I did check if the handles was still sturdy attached and yes they were. I was surprised that after just one day of drying it was practically the same. This means for sure that the treating of the wood against moist and the elements are very well and how the wood plates are attached to the sideliners is much sturdier than I thought. The forces inside a washing machine at such an incredible speed say a lot. It`s been protected by other clothes during this cycle against hits but for sure this rough tumble proves much. Every function was the same as before too. The introduction of the EvoWoods was no joke but actually an introduction of quality with a superb design that is eye pleasing. Because of friction agains keys and different fabrics the surface on the wood is a bit different in color than originally. Wood changes also by time.